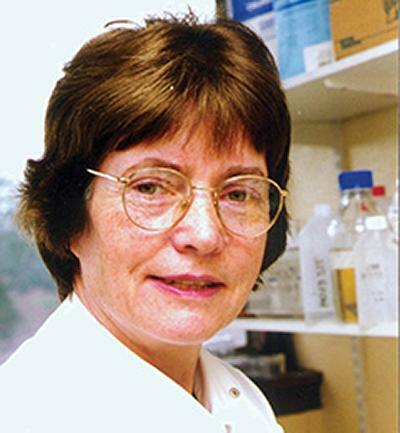 Professor Freda Stevenson is Professor of Immunology within Medicine at the University of Southampton. As an immunologist aiming to apply molecular understanding to clinical problems, my research has focused on B lymphocytes. This includes two aspects: first, analysis of the ways by which normal human B cells become malignant and second, in developing strategies to activate anti-tumour immunity. In 2015, she was awarded the Rai-Binet medal for her work on chronic lymphocytic leukemia by the International Workshop on CLL. The second area of research began from investigating the use of surface idiotypic Ig on B-cell tumours as a target for immune attack. Using the idiotypic antigen, she developed genetic vaccines in which DNA encoding a tumour antigen linked to an alert signal is injected directly (Nature Medicine 1998). Application of these novel vaccine designs to other antigens expressed by various cancers followed, with clinical application via a collaboration with Prof Christian Ottensmeier/Dr Natalia Savelyeva. In 2014 Professor Stevenson received the Jean Bernard Lifetime Achievement award from the European Haematology Association for this work. In 2018 Professor Stevenson received the Henry M Stratton medal of the American Society of Hematology in recognition of her pioneering work in B-cell malignancies. Professor Stevenson is an elected Fellow of the Academy of Medical Sciences and is an Associate Editor of the top haematological journal Blood. 1965-67 Lecturer in Biochemistry, University of Sydney. 1967-70 Post-doctoral fellow, University of Oxford. Lecturer in Biochemistry, Oriel College, Oxford. 1970-73 MRC external scientific staff appointment, Tenovus Research Laboratory, Southampton General Hospital. 1973-81 Tenovus post-doctoral fellow in leukaemia research. Tenovus Research Laboratory, Southampton General Hospital. 1981-95 Principal Scientific Officer, Regional Immunology Service, Tenovus Research Laboratory, Southampton General Hospital. Honorary Visiting Fellow, University of Southampton. Honorary Reader in Immunology, University of Southampton. 1995- Consultant Immunologist, Wessex Immunology Service, Southampton University Hospitals. Her research interests continue in the field of human B-cell malignancies working closely with Dr Francesco Forconi on the effects of new drugs in CLL. She also works with Prof Graham Packham on the pathogenesis of human follicular lymphoma with novel findings reported (Proc Natl Acad Sci 2010), and on signalling pathways operating in normal and malignant human B cells, with new significant findings already published. We then designed minimized fusion genes to induce specific cytolytic T-cell responses against intracellular tumor antigens.4 Minimizing was an important modification to avoid introducing competitive MHC Class I-binding sequences. An additional novel approach was to place a tumor epitope sequence at the C-terminus of the fusion gene which assists processing and presentation, opening the design for a wide range of defined tumour antigens.4 An epitope from prostate-specific membrane antigen is now in trial for patients with prostate cancer, using electroporation. This technique appears to overcome the apparent block in translating DNA vaccination to human subjects. Assessment of immune responses in the first 20 patients show robust vaccine-induced CD8+ T-cell responses against the target tumor cell antigen in 70%. This is a striking validation of a strategy developed in pre-clinical models operating successfully in the clinic. The next trial will target an antigen on chronic myeloid leukaemia, clinically maintained but not cured by tyrosine kinase inhibitors (Imatinib), where again pre-clinical validation has been made. For follicular lymphoma, we made the first observation that most, possibly all, cases have N-glycosylation sites in their variable regions introduced by somatic mutation. These positively selected sites acquire unusual oligosaccharides, able to interact with stromal lectins.8 This could bypass the need for antigen to maintain tumour survival in the germinal center, and therapeutic strategies could be aimed at blockade. Our studies of immunogenetics have illuminated pathogenesis and prognosis, and are revealing potential treatments for a range of B-cell tumours. 1. Hawkins R.E., Zhu D., Ovecka M., Winter G., Hamblin T.J., Long A. & Stevenson F.K. (1994) Idiotypic vaccination against human B-cell lymphoma. rescue of variable region gene sequence from biopsy material assembly as single chain Fv “personal” vaccines. Blood 83:3279-3288. 2. King CA, Spellerberg MB, Zhu D, Rice J, Sahota SS, Thompsett AR, Hamblin TJ, Radl J & Stevenson FK. (1998) DNA vaccines with single chain Fv fused to Fragment C of Tetanus Toxin induce protective immunity against lymphoma and myeloma. Nature Med. 4(11): 1282-1286. 3. Stevenson FK, Rice J, Ottensmeier CH, Zhu D, Buchan SL, Roddick J, King AJ & Savelyeva N (2004). DNA vaccines to attack cancer. Proc Natl Acad Sci, 101 Suppl 2:14646-52. 4. Rice J, Ottensmeier CH, Stevenson FK (2008). DNA vaccines: precision tools for activating effective immunity against cancer. Nat Rev Cancer 8: 108-120. 5. Savelyeva N, King CA, Vitetta ES, Stevenson FK (2005). Inhibition of a vaccine-induced anti-tumor B cell response by soluble protein antigen in the absence of T cell help. Proc Natl Acad Sci 102 (31): 10987-92. 6. Hamblin T.J., Davis Z., Oscier D.G. & Stevenson F.K. (1999) Unmutated immunoglobulin VH genes are associated with a more aggressive form of chronic lymphocyte leukemia. Blood 94(6):1848-1854. [>1000 citations]. 7. Mockridge CI, Potter KN, Wheatley I, Neville LA, Packham G, Stevenson FK (2007). Reversible anergy of sIgM-mediated signaling in the two subsets of CLL defined by VH-gene mutational status. Blood 109:4424-4431. Full -time university lecturer (1965-67). Regular supervision of PhD, DM and MPhil students (4-5 in post per year). Regular external (national and international) and internal examiner of PhD students. Supervision of medical students and clinical fellows on projects and intercalated degrees. Lecturer on Graduate School Research Training Programme. Lecturer on MRCP courses for clinical trainees. National Assessor for applications for registration by the Health Professional Council. Member of the Scientific Review Panel of the Helmholtz Programme “Cancer Research” Heidelberg, Germany. Member of the Scientific Review Panel of the Helmholtz Programme “Infection and Immunity” Braunschweig, Germany. Member, Special Study Section, NIH Centre for Scientific Review, Bethesda, USA. Member, NIH Experimental Immunology Study Section, Washington. Permanent Member of the Review Panel: Italian Ministry for Education, University and Research (MIUR-COFIN). Member of the Board of Experts of the Italian Ministry of Education of the Committee of Research Evaluation. Member, Scientific Advisory Board, Multiple Myeloma Research Foundation (MMRF), USA. Hardwick, N., Buchan, S. L., Ingram, W., Khan, G., Vittes, G. E., Rice, J., ... Guinn, B. (2013). An analogue peptide from the Cancer/Testis antigen PASD1 induces CD8+ T cell responses against naturally processed peptide. Cancer Immunity, 13(16). Furmanski, A. L., Ferreira, C., Bartok, I., Dimakou, S., Rice, J., Stevenson, F. K., ... Dyson, J. (2008). Public T cell receptor ?-chains are not advantaged during positive selection. Journal of Immunology, 180(2), 1029-1039. Radcliffe, J. N., Roddick, J. S., Stevenson, F. K., & Thirdborough, S. M. (2007). Prolonged antigen expression following DNA vaccination impairs effector CD8(+) T cell function and memory development. Journal of Immunology, 179(12), 8313-8321. Radcliffe, J. N., Roddick, J. S., Friedmann, P. S., Stevenson, F. K., & Thirdborough, S. M. (2006). Prime-boost with alternating DNA vaccines designed to engage different antigen presentation pathways generates high frequencies of peptide-specific CD8+ T cells. Journal of Immunology, 177(10), 6626-6633. Savelyeva, N., & Stevenson, F. K. (2006). Vulnerability of a vaccine-induced anti-tumor B-cell response to soluble protein antigen in the absence of T cell help. Journal of Immunology, 176, S253-S254. Buchan, S., Gronevik, E., Mathiesen, I., King, C. A., Stevenson, F. K., & Rice, J. (2005). Electroporation as a "prime/boost" strategy for naked DNA vaccination against a tumor antigen. Journal of Immunology, 174(10), 6292-6298. Pop, L. M., Smallshaw, J. E., Tucker, T. F., Stevenson, F. K., & Vitetta, E. S. (2005). Failure of vaccination with idiotypic protein or DNA, (+/-IL-2), the depletion of regulatory T cells, or the blockade of CTLA-4 to prolong dormancy in mice with BCL1 lymphoma. Journal of Immunotherapy, 28(6), 525-534. Stevenson, F. K. (2005). Turning genes into cancer vaccines. Discovery Medicine, 5(25), 37-42. Stevenson, F. K. (2005). Update on cancer vaccines. Current Opinion in Oncology, 17(6), 573-577. Rice, J., Buchan, S., Dewchand, H., Simpson, E., & Stevenson, F. K. (2004). DNA fusion vaccines induce targeted epitope-specific CTLs against minor histocompatibility antigens from a normal or tolerized repertoire. Journal of Immunology, 173(7), 4492-4499. Heslop, H. E., Stevenson, F. K., & Molldrem, J. J. (2003). Immunotherapy of hematologic malignancy. Hematology, The Education Program, 331-349. Rice, J., Buchan, S., & Stevenson, F. K. (2002). Critical components of a DNA fusion vaccine able to induce protective cytotoxic T cells against a single epitope of a tumor antigen. Journal of Immunology, 169(7), 3908-3913. Potter, K. N., Mockridge, C. I., Rahman, A., Buchan, S., Hamblin, T., Davidson, B., ... Stevenson, F. K. (2002). Disturbances in peripheral blood B cell subpopulations in autoimmune patients. Lupus, 11(12), 872-877. Zhu, D., & Stevenson, F. K. (2002). DNA gene fusion vaccines against cancer. Current Opinion in Molecular Therapeutics, 4(1), 41-48. Potter, K. N., Hobby, P., Klijn, S., Stevenson, F. K., & Sutton, B. J. (2002). Evidence for involvement of a hydrophobic patch in framework region 1 of human V4-34-encoded Igs in recognition of the red blood cell I antigen. The Journal of Immunology, 169(7), 3777-3782. Thirdborough, S. M., Radcliffe, J. N., Friedmann, P. S., & Stevenson, F. K. (2002). Vaccination with DNA encoding a single-chain TCR fusion protein induces anticlonotypic immunity and protects against T-cell lymphoma. Cancer Research, 62(6), 1757-1760. Stevenson, F. K. (2001). DNA vaccination: genes versus cancer. The Biochemist, 23, 10-13. Stevenson, F. K., Zhu, D., & Rice, J. (2001). New strategies for vaccination and imunomodulation in NHL. Annals of Hematology, 80(Supplement 3), B132-B134. Baxendale, H. E., Davis, Z., White, H. N., Spellerberg, M. B., Stevenson, F. K., & Goldblatt, D. (2000). Immunogenetic analysis of the immune response to pneumococcal polysaccharide. European Journal of Immunology, 30(4), 1214-1223. Hamblin, T. J., Orchard, J. A., Gardiner, A., Oscier, D. G., Davis, Z., & Stevenson, F. K. (2000). Immunoglobulin V genes and CD38 expression in CLL. Blood, 95(7), 2455-2457. Bhat, N. M., Bieber, M. M., Spellerberg, M. B., Stevenson, F. K., & Teng, N. N. (2000). Recognition of auto- and exoantigens by V4-34 gene encoded antibodies. Scandinavian Journal of Immunology, 51(2), 134-140. Hamblin, T. J., Davis, Z., Gardiner, A., Oscier, D. G., & Stevenson, F. K. (1999). Unmutated immunoglobulin VH genes are associated with a more aggressive form of chronic lymphocyte leukemia. Blood, 94(6), 1848-1854. Oscier, D. G., Thompsett, A., Zhu, D., & Stevenson, F. K. (1997). Differential rates of somatic hypermutation in V(H) genes among subsets of chronic lymphocytic leukemia defined by chromosomal abnormalities. Blood, 89(11), 4153-4160. Savelyeva, N., Zhu, D., & Stevenson, F. K. (2004). Engineering DNA vaccines that include plant virus coat proteins. In S. E. Harding (Ed. ), Biotechnology & Genetic Engineering Reviews (pp. 101-114). (Biotechnology and Genetic Engineering Reviews; Vol. 20, No. 20). Springer. Rahman, A., Stevenson, F. K., & Isenberg, D. A. (2000). B cells- formation and structure of autoantibodies. In J. S. H. Gaston (Ed. ), Rheumatic Diseases. Immunological Mechanisms and Prospects for New Therapies (pp. 61-78). Cambridge, GB: Cambridge University Press.